The lady getaway driver who aided Eric Holder, alleged Nipsey Hussle’s killer, has said she was not involved in the shooting and had no idea about it beforehand. According to TMZ, the getaway driver who says she was in the car with Eric Holder after he allegedly shot and killed Nipsey Hussle told them – she was with Holder on Sunday but she had no idea what he was doing. We got tipped that the car police say Holder used was taken to an auto shop last June. We found out from people connected to the shop there was indeed a car that came in with the license plate in question. The name on the invoice was Eric Holder, along with a phone number. We called the number and a woman answered. She said she did not know Holder last June but subsequently did get to know him. That didn’t make a lot of sense because it appears the car is registered to either her or someone in her family … yet Holder’s name was on the invoice. She told us it was her car. 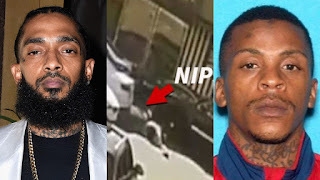 The woman then said she subsequently began a friendship with Holder and she was with him Sunday when they drove to Nipsey’s clothing store near the Crenshaw District of L.A.
She claims she was waiting for him in the alley when he went over to the clothing store. She also claims she didn’t know why he was going there and he didn’t say anything when he came back to the car. We contacted detectives on the case who said they have not yet received such a call. The woman hung up on us before answering additional questions … like where is Holder now?